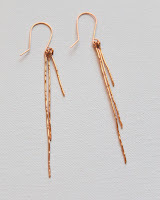 "These earrings are so much fun to make and wear! The only material you need is wire! I used 18 gauge copper, but you could use any metal you like. This tutorial will get you started with some very basic hammering. If you haven’t done it before, this is a great tutorial to start with. I also have a great tip for making your loops all the same!